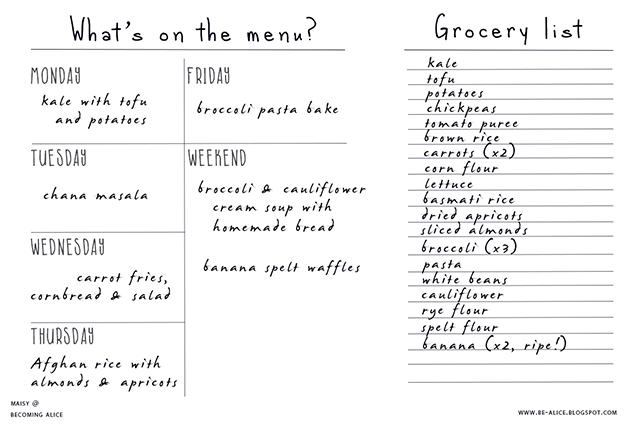 I have another week menu for you! - We started the week with another batch of good old German (and vegan) Kale "Stew": kale (1kg) cooked with onions (500g), potatoes (1kg), vegetable broth (500ml), tofu (400g) marinated in soy sauce (1-2 tbsp), served with mustard and chopped walnuts. One of my all-time favourites! And super duper healthy. - On Tuesday I made some Chana Masala for my boyfriend and me (our first time trying this Indian blend of spices, onions, garlic, chickpeas, and tomatoes). We served this with brown rice. - For Wednesday we opted for a mixed plate: carrot fries, cornbread and a big salad to go with the rest. Simple and satisfying. - On Thursday we tried another new recipe: Afghan Rice with Turmeric, Almonds and Dried Apricots. We paired this with zucchini, carrots and green beans for some more greens in this meal. Similar recipe over here. (I used less salt, and I substituted coconut oil for butter - it also adds an amazing coconut flavour to the dish!). - Friday was our "flour day" - we try to reduce our intake of processed flour, whether white or whole-grain, to one or two dishes a week. That week it was a creamy Broccoli Pasta Bake (with corn pasta) with a sauce made of white beans and garlic. We also sprinkled some crushed almonds on top. - That weekend we had leftover pasta bake, then on Sunday we made my favourite banana spelt waffles and later that day we made warming Broccoli & Cauliflower Cream Soup with homemade whole grain spelt and rye bread (I need to turn this into a recipe post at some point).